Five residents attended the meeting held in the Yoxall and before the meeting began the Chairman invited anyone who had anything they wished to be addressed to speak. One resident expressed concern about the road crossing adjoining the Bovis housing estate being invisible from the Sandbach side of the Crewe Road. These concerns were taken on board by the Councillors and the meeting began. Councillor Mrs Farrall attended the Holocaust Memorial Service at Sandbach recently and commented on the excellent playing of the introductory music by a Haslington young man, Mark Wheeler. The service was a fitting memorial to the victims of the Holocaust and two sisters who were in their nineties gave a very graphic account of their own experiences of the Holocaust in this terrible time. 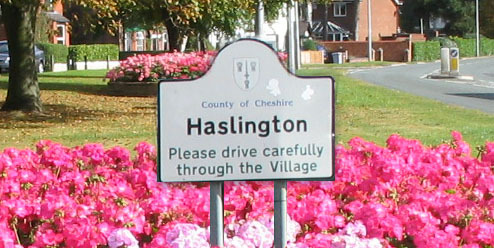 The Chairman had not received a report from the police about the crime figures in Haslington over the last month and he expressed his disappointment over this. The lack of support from police regarding the Speedwatch was also very disappointing. One of the team had resigned from the Speedwatch and it was hoped that a replacement volunteer could be found very quickly. The missing street light in the Dingle that had been reported at the last two Parish Council meeting had still not been replaced. It was reported that the surface in Maw Lane was very dangerous with many potholes. This road is being used regularly, more so now that the Crewe Green Roundabout is under reconstruction and the problem needs to be addressed quickly. The problem does seem to be easing with motorists recognising the times of congestion. Holmshaw Lane is also being used more and because it is so narrow and the ditches on each side are full and the sides are very wet; this has resulted in one very nasty accident to date. Kents Green Lane is also flooded, and the problem is not being addressed. All the roads in the Parish need the gutters sweeping they are in a disgusting state. The ceremony of the William Dykes road sign is ongoing, and it is hoped that this will take place shortly. There was a request to move a footpath at Sydney to a more suitable area and this was agreed. The Data Protection Act is to take place in February 2018. A request to erect a seat in remembrance of Mrs Broadbent was agreed and the site suggested was on the verge adjoining Kents Green Lane. A request for a seat in remembrance of Graham Harrop had previously been made and both of these requests have been referred to the appropriate authority. The ANSA playing field project is going ahead, this is to provide more equipment for all ages on the playing field. This year’s Fun Day in May is to be held on the Village Green on 12 May (Note the new date). If anyone would like a full report of the February meeting can they please ring the Clerk, Mrs Joan Adams, on 568760. This will be issued after the March meeting to be held on 5 March 2018.